Oh, the memories of growing up in Switzerland, now packed into a minimalist nifty Swiss Railway Clock iPhone App (iTunes Link) by Thomas Feger. The clock, prominently displayed in every railway station in Switzerland, can be found more than 3’000 times across the country. Back in the 1940s when the Swiss Federal Railways (SBB) was looking for a way to take advantage of their name for punctuality and incorporate this theme into their national image, they asked Hans Hilfiker, an SBB employee, engineer and prolific inventor, to come up with a highly visible clock that would not only form the basis of their later corporate identity, but it would help to guarantee on time departures as well. Hilfiker, an exponent of products that were both functional and well designed, created the Railways’ masterpiece in 1944. The design, with its clear and easily read face, mimics the smooth running of the trains and incorporates clever features that demonstrate punctuality in a highly visible fashion. 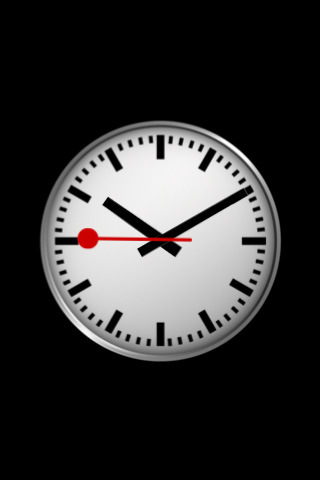 The SwissRailwayClock is also available as a Mac OS X dashboard widget. Ah I had these clocks in my school as well! Feeling very nostalgic for CH. Ha! We’ve got the same in every Belgium trainstation aswell… are these clocks the same all over Europe I wonder? Such a classic icon of Swiss life. And it’s true about the punctuality as soon as that second hand sweeps round to the 12 position (it pauses for the briefest of moments there) the doors close and the train starts off. If it says 8:12 on the timetable that is the time the train leaves, exactly. I have a replica of one of these sitting right here in my office and I’m based in New Zealand! Version 3.0.550 (@ http://sites.google.com/site/josephbeer/Home/swiss-railway-clock) is out now!